FingerTec Worldwide have launched their latest exit slave reader the R2c. 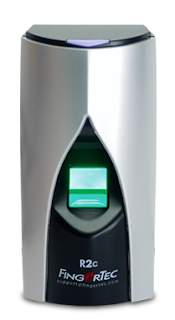 The R2c works exclusively with the R2 to create a cost-effective entry-exit reader. Not containing any memory or processor, the R2c relies on the R2 to verify a fingerprint/card in order to unlock the door. The R2c is the very much improved version of R2i. Designed to enhance the R2i’s features, the R2c excels in various fields where the R2i lacks. Previously using a customized communication cable (USB+RS232 standard) between the R2 and R2i, the all new R2c will be armed with a new improved RS485 wire which allows the R2 & R2c to cater for different installation environment. The RS485 wire can support a maximum 1000m of connection length, thus offering a huge range of installation prospects. Following the R2’s new hardware upgrade, the R2c can work with the fingerprint templates enrolled with the algorithm BioBridge VX10.0. The algorithm Biobridge VX10.0 offers a more sensitive and accurate reading of a fingerprint during enrolling and verification, as well as a quicker scanning speed. This will solve the problem of the R2i’s inconsistency in fingerprint scanning. However, the R2c is only compatible with the fingerprint templates enrolled with the algorithm Biobridge VX10.0. If the R2 is running with the fingerprint templates enrolled with the algorithm Biobridge VX9.0, the R2c will fail to verify and fingerprint scanning.